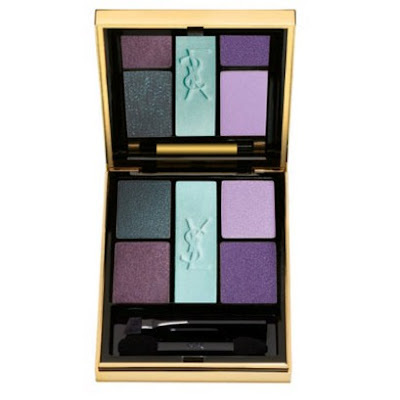 When I first saw the advertisements for the YSL Fall 2011 collection, I knew I had to have this palette. However I felt apprehensive about the cost and whether I would actually wear the colours. I am usually to lazy to wear eyeshadows and if I do they are normally neutral colours. In the end my lovely Nanna gave it to me for Christmas (at my suggestion), she is the best! The whole collection includes lipsticks, nail polishes and blushes. This collection is full of colour! From violet lipsticks to purple eyeshadows and deep green nail polishes. I actually have three of the lipsticks in the collection and will review them soon, with the rest of my YSL Volupte lipsticks. The Midnight Garden (number 11) palette contains four shadows and one highlighter. The shadows are a dark forest green with sparkle, an aubergine with sparkle, a lightly sparkled violet and a lightly sparkled lilac. The highlighter is the larger pan in the middle of the palette, it is a pale, sparkly greeny-blue. The packaging is very luxe and very YSL. Who doesn't love a bit of gold in their life? The shadows are quite generous in size. It would take a lot of use to hit pan on this baby! This palette has good colour payoff, the shadows are silky in texture and apply easily. It does not take much work to get an intense colour. The highlighter is perfect to apply under the brow bone. I like to make a quite smokey eye using the rest of the shadows. The dark green is probably not the best for day wear as it is quite sparkly, though used sparingly it would work. I have found that the shadows last through the day and do not crease, I do however use a primer underneath them. Taken in natural light, the highlighter is swatched at the top. oh my gosh the dark forest green colour looks amazing!